On the north-west corner of Wabash avenue and Harrison street stands this stately and imposing edifice. It was completed in 1857. The style is Gothic, with old English detail. The fronts are of brisk-hammered stone, with fine cut stone trimmings and cornices. Two turrets, with projecting buttresses at the sides and angles, complete the exterior finish. The dimensions of the building are as follows: depth on Harrison street one hundred feet, breadth on Wabash avenue sixty five feet, height of walls, forty-two feet, height to the apex of the roof seventy-five feet, height of the corner turrets one hundred feet. The interior of the church is handsomely finished. The basement is divided into a lecture and Sabbath-school room, forty by sixty-two feet, several class rooms, and the pastor’s library room. The heating apparatus is also in the basement. These several rooms are neatly and comfortably furnished. The main audience room occupies the full size of the interior of the building—sixty-two by ninety feet in the clear, including the vestibule. The church is furnished with self-supporting galleries on the sides, and with a spacious choir and organ gallery over the vestibule; the view in the church is therefore unobstructed by columns. The height of the ceiling is forty-five feet. This audience room, including the galleries, will seat nine hundred persons. The interior finish is quite ornate, with open timber-work in the roof, forming a ceiling divided into sections and panels, which spring from corbels on the walls, terminating with richly carved pendants at the vaulted portion of the ceiling. Various fine specimens of Gothic carving adorn the spandrels and panels. The timbered work of the roof, and the pulpit and pews, are grained in imitation oak, and the walls are stuccoed. These carvings were designed by the architect. The windows are of stained glass, and the choir gallery is finished in Gothic style. The organ, which is a very fine one, was built by Mr, William A. Johnson, of Westfield, Massachusetts, and was put into the church at a cost of three thousand five hundred dollars. The church has had its financial troubles. It was completed just before the panic of 1957, and the debt oppressively felt for a long time. 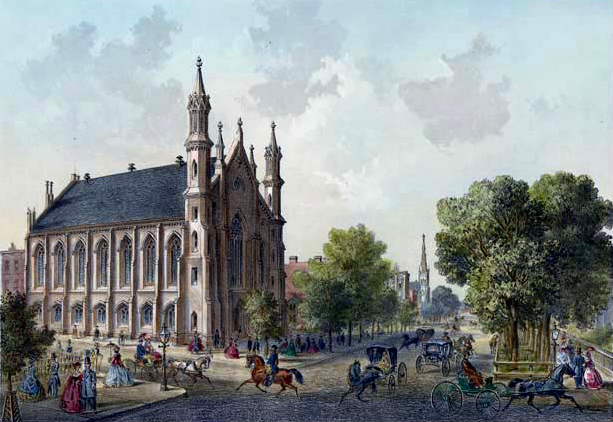 The church in April, 1857, numbered fifty-seven members; several of these have passed away, but the smaller number has largely increased. The first Board of Trustees were Messrs. George C. Cook, E. G. Reynolds, Daniel Goss, W. B. Philips, H. W. Clark, W. M. Doughty, Lott Frost, and C. H. Abbott. The Building Committee were Messrs. George C. Cook and Danial Goss. The design of the building was furnished by Boyington and Wheelock, but it was erected under the superintendency of W. W. Boyington, architect of Chicago. The whole cost of the building was sixty-five thousand dollars. The present Board of Trustees consists of Messrs, George C. Cook, Orrington Lunt, Daniel Goss, W. B. Philips, C. B. Heartt, L. Richards. Ralph Connable, S. P. Lunt, and W. H. Rand. The first pastor was the Rev. William M. D. Ryan, who had previously been pastor of a congregation in the city. Through his exertions a subscription was made of about half the cost of the building. Before the building was ready for occupancy the financial disaster had fallen upon the country, and a large portion of this subscription was never realized. The debt due upon the church, when completed, was about forty thousand dollars. Dr. Ryan was succeeded in the pastorate by the Rev. Mr. Krebs, of Baltimore, who remained one year, and left in 1860. In that year the Rev. Henry Cox was appointed pastor, and remained two years. During his time the debt, which had increased, was somewhat reduced. In 1862 the Rev. Robert Collier was appointed to this church. In the mean time the membership had steadily increased, and under the management and liberality of such men as John V. Farwell, George C. Cook, Orrington Lunt, John F. Carter, and others, the whole debt was discharged. Mr. Collier was succeeded, in 1865, by the Rev. R. M. Hatfield, the present eloquent and much loved pastor. The congregation have been fortunate in the choice of the several gentlemen who have been pastors from the first organization to the present day. They have all been active, earnest, and able men, and have contributed to increase and foster that unity which has marked the affairs of the church, both spiritual and temporal, during all that time.